During Apple's fiscal first quarter of 2019 (which covered the three month period from October through December), the company reported that revenue from iPhone sales declined 15% year-over-year. Since Apple no longer reports the number of units it sells during a quarter, all we know is that sales of the handset brought in $51.9 billion during the holiday quarter. That was down from the $59.8 billion that Apple collected during the 2017 holiday quarter. According to SeekingAlpha, stock researcher OTR Global released a report estimating that iPhone shipments during the first calendar quarter (Apple's fiscal second quarter) fell into a range between 37 million units and 42 million units. That was a decline from the firm's previous forecast, made in January, that called for Apple to deliver 40 million to 45 million iPhones from January through March. 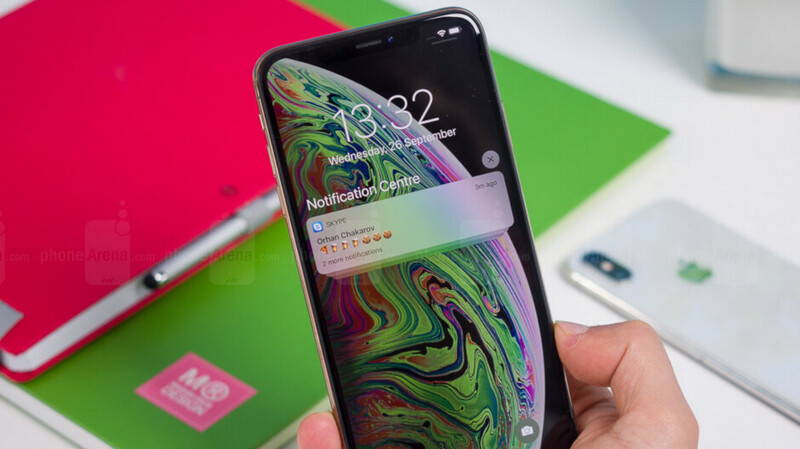 OTR Global says that weak demand for the 2018 iPhone models (iPhone XS, iPhone XS Max, and iPhone XR) forced it to lower its estimate. For the second calendar quarter (Apple's fiscal third quarter of 2019) that includes April through June, the stock researcher expects 28 million to 33 million iPhone units to be shipped. That would be a year-over-year decline of 21% to 24%. The decline in iPhone shipments hasn't been a total surprise to Apple. A couple of years ago the company vowed to double its services revenue from the $25 billion it took in during 2016, to $50 billion by 2020. The unit, which is the second largest and most profitable business run by Apple, sells services and subscriptions for the nearly 1 billion iPhones in use around the world. The unit includes iTunes, Apple Music, Apple News+, Apple TV+, App Store, Arcade (starting this fall), AppleCare and more. Some analysts believe that the next big thing from Apple will be its AR glasses. The latest word about the device dubbed "Apple Glasses" is that mass production will start during the second calendar quarter of 2020, according to reliable analyst Ming-Chi Kuo of TF International. Kuo says that the glasses, at least at first, will depend on a paired iPhone to work. Nearly two years ago, analyst Gene Munster said that Apple Glasses will be bigger than the iPhone. During an interview that Apple CEO Tim Cook gave last month, he said to expect a "long, great roadmap of fantastic" products ahead. Returning to the iPhone, yesterday Apple cleared up a potential issue by reaching a settlement with Qualcomm, ending all legal battles with the chip maker. Not sure whether Intel could deliver its 5G modem chip in time for the launch of a 5G iPhone in 2020, Apple had looked at other chip companies including Samsung and MediaTek. But by making the deal with Qualcomm, which will cost Apple an undisclosed amount of cash, the company also locked in a multi-year supply of modem chips (including 5G modem chips, we assume). The news was well received by many iPhone users who feel that Qualcomm's modem chips are far superior to Intel's. In fact, after news of the settlement broke, Intel announced that it would immediately stop developing 5G modem chips. The licensing deal with Qualcomm that was announced yesterday runs for six-years with an option for another two-years. Terms of the chipset supply agreement were unannounced. The 2019 iPhones should be announced in September. The latest rumors call for a 6.5-inch iPhone XI Max, a 6.1-inch iPhone XI and a sequel to the iPhone XR. There are conflicting reports about whether all three models will have OLED screens, or if the iPhone XR (2019) will continue to sport an LCD display. No surprise. Other news, Samsung Gold sell like hot cakes, even $2000. This price thing need to be stop. Even computer prices have crept back up because of the materials used to build them. Was it 9000 Galaxy folds (4500 at two carriers) I read somewhere? The Galaxy Fold is a truly innovative masterpiece. So it's totally acceptable that it sells for an expensive price, and it deserves high sales volume because of its sheer innovation. The iPhones, on the other hand, are overpriced craps that lack any innovation in them. So technically, they still have a window of overlap between 40 and 42 million units? Let’s see: Samsung is selling a lot of midrange units successfully, OnePlus historically has had record sales, and Apple is having problems with their iPhone sales. A normal person would say that there’s a value problem here but these execs think that there is no problem with thinking people can just spend $1000 for a phone. You make an interesting point that I haven't really seen in the comments. You can throw in margin numbers, revenue, and ASP through the roof, but it appears that cheaper phones are selling more successfully. It makes you think... maybe it doesn't matter if your brand is selling more flagships, but just that you're enjoying the phone you have. Maybe the most expensive phone isn't necessary for someone to be happy. Maybe, just maybe, the fanboys can stop arguing and just enjoy heir life since the phone a different person they'll never meet doesn't affect them. Btw, to get on that good good that brought me to that place ^^ Talk to my boy Ronnie the Don on 7th street. tell em Leroy the MeBoy sent you. lolz. Now here we go again guessing... Analysts = ihaters They are always wrong and one sided. No wonder there are lawsuit to apple about their income reporting, that they suffer from apple stock manipulation. Can I get a translation on this mess?